For other uses, see Pulse (disambiguation). 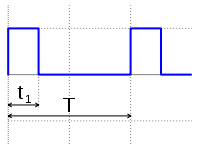 A repeating pulse represented graphically as on an oscilloscope. In music and music theory, the pulse consists of beats[clarification needed] in a (repeating) of identical yet distinct periodic short-duration stimuli perceived as points in time occurring at the mensural level. "This pulse is typically what listeners entrain to as they tap their foot or dance along with a piece of music (Handel, 1989), and is also colloquially termed the 'beat,' or more technically the 'tactus' (Lerdahl & Jackendoff, 1983)." "Even a person untrained in music, can generally sense the pulse and may respond by tapping a foot or clapping." Simple quadruple drum pattern, rock drum kit. Despite the presence of eighth notes, there is a quarter note beat. The pulse may be audible or implied. The tempo of the piece is the speed of the pulse. If a pulse becomes too fast it would become a drone; one that is too slow would be perceived as unconnected sounds. When the period of any continuous beat is faster than 8–10 per second or slower than 1 per 1.5–2 seconds, it cannot be perceived as such. "Musical" pulses are generally specified in the range 40 to 240 beats per minute. The pulse is not necessarily the fastest or the slowest component of the rhythm but the one that is perceived as basic. This is currently most often designated as a crotchet or quarter note when written (see time signature). While ideal pulses are identical, when pulses are variously accented, this produces two- or three-pulse pulse groups such as strong-weak and strong-weak-weak and any longer group may be broken into such groups of two and three. In fact there is a natural tendency to perceptually group or differentiate an ideal pulse in this way. A repetitive, regularly accented pulse-group is called a metre. Pulses can occur at multiple metric levels - see figure. Pulse groups may be distinguished as synchronous, if all pulses on slower levels coincide with those on faster levels, and nonsynchronous, if not. An isochronal or equally spaced pulse on one level that uses varied pulse groups (rather than just one pulse group the whole piece) create a pulse on the (slower) multiple level that is non-isochronal (a stream of 2+3... at the eighth note level would create a pulse of a quarter note+dotted quarter note as its multiple level). ^ a b c Winold, Allen (1975). "Rhythm in Twentieth-Century Music", Aspects of Twentieth-Century Music. Wittlich, Gary (ed.). Englewood Cliffs, New Jersey: Prentice-Hall. ISBN 0-13-049346-5. ^ Fitch, W. Tecumseh and Rosenfeld, Andrew J. (2007). "Perception and Production of Syncopated Rhythms", p.44, Music Perception, Vol. 25, Issue 1, pp. 43–58, ISSN 0730-7829. ^ Benward, Bruce and Saker, Marilyn (2003). Music: In Theory and Practice, Vol. I, p.9. 7th edition. McGraw-Hill. ISBN 0-07-294262-2.